Recognise Palestine and stop Israel’s blatant atrocities to stand a chance of ending terrorism. Prime Minister Tun Dr Mahathir Mohamad said the present war against terrorism would only be elongated if the root causes were not addressed. “This present war against the terrorists will not end until the root causes are found and removed and hearts and minds are won. “What are the root causes? In 1948, Palestinian land was seized to form the state of Israel. The Palestinians were massacred and forced to leave their land. “They tried to fight a conventional war with help from sympathetic neighbours. The friends of Israel ensured this attempt failed. More Palestinian land was seized. 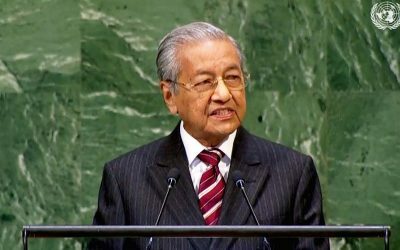 “Frustrated and angry, unable to fight a conventional war, the Palestinians resort to what we call terrorism,” Dr Mahathir said at the United Nations General Assembly (UNGA) in New York, today. No country and individual, he said, was safe because of this. He said the world had done nothing to stop Israel’s indiscretions. “The world does not care even when Israel breaks international laws, seizing ships carrying medicine, food and building materials in international waters. The Palestinians fired ineffective rockets which hurt no one. Ironically, he said the world rewarded Israel including deliberately “provoking Palestine by recognising Jerusalem as the capital of Israel”. “It is the anger and frustration of the Palestinians and their sympathisers that cause them to resort to what we call terrorism. But it is important to acknowledge that any act which terrify people also constitute terrorism. “And states dropping bombs or launching rockets which maim and kill innocent people also terrify people. These are also acts of terrorism. “Malaysia hates terrorism. We will fight them. But we believe that the only way to fight terrorism is to remove the cause. Dr Mahathir also criticised the Myanmar government and Aung San Suu Kyi for the massacre of the Rohingyas. “I believe in non-interference in the internal affairs of nations. But does the world watch massacres being carried out and do nothing? Nations are independent. But does this mean they have a right to massacre their own people, because they are independent?” he asked. Watch below the full speech of Dr. Mahathir at the UNGA. 11. But today, 15 years later the world has not changed much. If at all the world is far worse than 15 years ago. Today the world is in a state of turmoil economically, socially and politically. 29. But wars, we all know encourage and legitimise killing. Indeed the killings are regarded as noble, and the killers are hailed as heroes. They get medals stuck to their chest and statues erected in their honour, have their names mentioned in history books.